The BERNINA 830 is in a class all its own. It is the crown jewel among all machines, with technology so advanced and features so thoughtful that it almost becomes an extension of your own creativity. Get ready to go bigger, go faster and make the most of every—single—stitch. The 830 offers twice the space of a standard sewing machine and 50% more space than the largest top-of-the-line machines. A 15-inch extended arm, a full 12 inches to the right of the needle, expanded height clearance, and 12 ½ inches of diagonal space (compared to 8 inches on standard machines) lavish you with room to spread out, room to maneuver. When you include the embroidery module, the 830 is an impressive 40 inches long. Our optional jumbo hoop (400 x 260 mm / 16 x 10 inches) offers the most space for embroidery, too, without having to rotate or reposition. The BERNINA 830 also gives you more space under the needle; a 15mm clearance under the foot allows you to pivot and adjust your thickest layers of fabric. It’s the highest foot lift on the market. The BERNINA 830 boasts up to 1,100 sewing stitches per minute and up to 1,000 embroidery stitches per minute––the fastest of any home sewing machine. That’s remarkable when you consider that the embroidery speeds of competitive brands average only 765 stitches per minute. And what’s even more outstanding is that at top speed, the BERNINA 830 doesn’t vibrate; it hums with quality. At top speed, your embroidery is gorgeous, and even your widest stitches are flawless. And you can easily customize your speed with a convenient slide-speed control right on the front of your machine. Our patented jumbo bobbin provides 40% more thread capacity, so you spend more time creating and less time prepping––whether you’re sewing or embroidering. Plus, this innovative bobbin is so easy to use. The hook swings out, the bobbin releases and pops out with a simple touch of a finger. And there’s no need to remove your projects because this front-loading bobbin is conveniently located. Every detail of our jumbo bobbin has been thought through to make your sewing as joyful as possible. It’s virtually free of vibration, there’s no damage if the needle breaks and you can see on screen how much thread you have left, so you can just play and play and play. Exclusive features, such as the BERNINA Stitch Regulator, give you the ultimate in creative control. This revolutionary presser foot makes free-motion sewing easy and fun. Your stitches are beautifully consistent, whether you sew fast or slow. And only the BERNINA 830 offers 360-degree-multi-directional sewing on all 9mm stitches. Plus, you can infinitely adjust length and width on all your stitches. But that’s just for starters. Our quick-reverse feature lets you step back into the exact same holes, so that new holes are not created going backward and forward. And our Altered Stitch Memory lets you remember your altered stitches when you turn off your machine or if the power goes off. 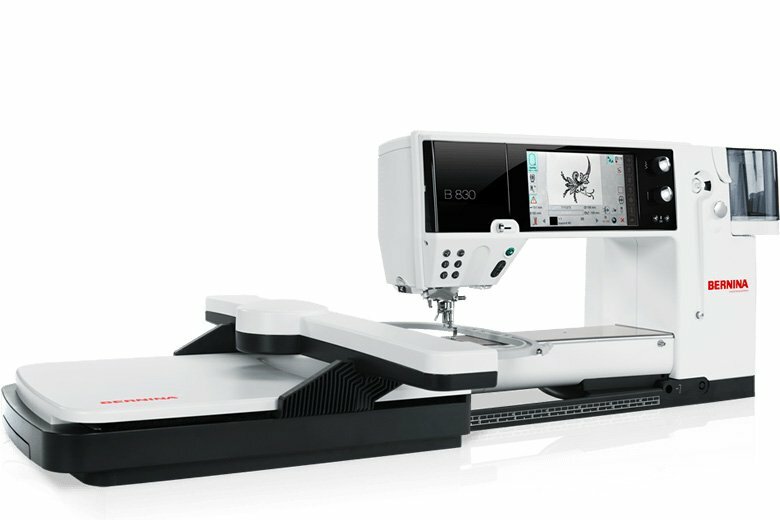 Only BERNINA features a centrally located touch screen, so you can view both the needle and screen with one quick glance. This 7-inch, TFT (thin film transistor) screen presents brilliant high-definition graphics, vivid colors, and is ultra-responsive to your touch. All functions are located on the main screen with large, easy-to-read icons for the simplest navigation. It’s technology at its most luxurious, with wallpaper customization, 3D icons, soft keys, and screen adjustments for light and contrast. Working with tricot, ribbon or lots of layers? The innovative BERNINA Dual Feed is built-in to the 830 to give you the most control when your fabrics are hard to manage. For even more control, the BERNINA Dual Feed can be fine-tuned to your specific fabric––great for velvet. This innovative feed system offers the ultimate in visibility and maneuverability, too. Then, when you choose, it flips up and tucks away. The optional walking foot is another fine choice, especially for outline, channel or grid quilting. You can also use the walking foot to quilt, then bind using the BERNINA Dual Feed. And because the 830 is a BERNINA, its standard feed system is just what you’d expect: durable, precise and consistent. The 830 gives you the best of all worlds. It took Swiss engineers to create this efficient, one-process threading system. Just bring the thread up through the guide, let it fall into the slot on top, slide it along the left side of the machine, press a button, and your needle is automatically threaded––no matter what position it’s in. Of course, because BERNINA always gives you choices, you have the option to thread your 830 manually as well.